The history of the library and how it has evolved to become such an important part of our community. Thank you to everyone who played a part in making this archive possible! 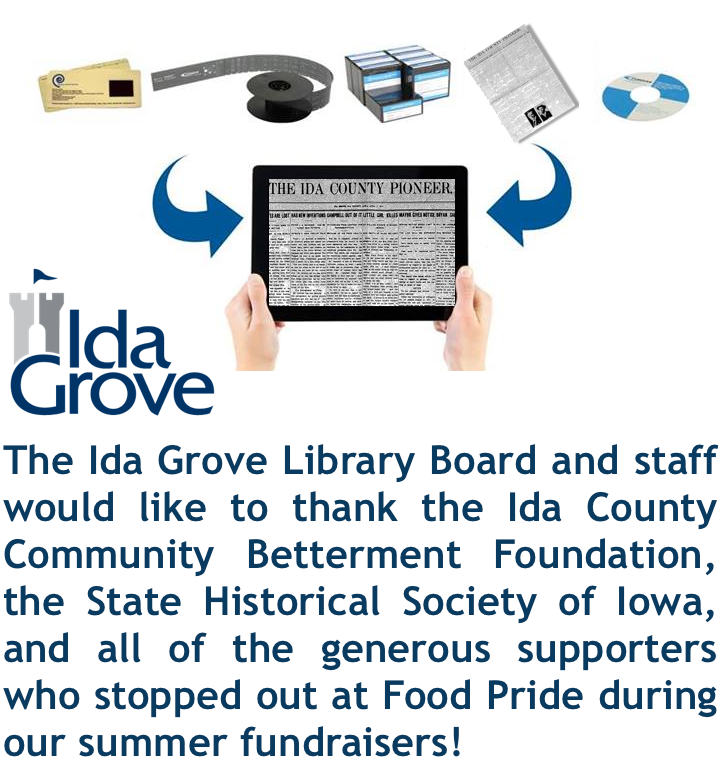 Through two grant awards and all of the generous community support, a portion of our local newspaper records are available online through the Community History Archive of the Ida Grove Public Library! This searchable archive is comprised of digitized newspapers from the late 1880's through the 1970's, as well as newer editions from 2004-2014. To view or search the archive, visit the library's website (www.idagrove.lib.ia.us) and click on the "Community History Archive" link. And remember...if an edition you are looking for has not been digitized and made available online, we have microfilm for in library use and trained staff who can help you find what you are looking for. This Newspaper Digitization Project includes titles ranging from 1880 to current which have been preserved on microfilm and made available online providing easy access to the digitized records, allowing you browse by year or by title. The Ida Grove collection includes the Ida County Pioneer record, Ida County Pioneer, Ida County Courier, Maple Valley Era, Ida Grove Era and Maple Weekly Republican Valley Era. “It’s so easy to use and searching the database brings back results that are relevant to my search, even things I didn’t think to look for.” –Anonymous genealogy researcher on 9/25/17. The Ida Grove Public Library got its start in 1908. The Women's Christian Temperance Union sent out five hundred invitations asking everyone to bring a book or two for the library. They thought this movement would result in the erection down town of a large and suitable building. The ladies of the Civic Club joined forces with W.C.T.U. in opening a public library and reading room in the old Women's Christian Temperance Union Hall just south of the opera house. About $100 was spent in buying new books. The library was kept open two afternoons and evenings a week all winter. From this the library steadily grew and prospered. Expenses of the library were paid by public subscription. Books were donated by the Civic Club and other citizens. The first trustees of the Ida Grove Library were Dr. G.C. Moorehead, Robert Lipton, Mrs. Wm Wilcox, and Alex Hartley. The first Librarian was Mrs. Anna Moorehead Goodrich. In 1910, the city council leased the east room of the city building upstairs to the library association. The association payed $1 a year rent and paid for heat, light, water and necessary repairs during the existence of this lease. In 1921, 6159 books were loaned out, more than half of which were juvenile books. In 1922 the library trustees met with the city council to discuss the library situation. 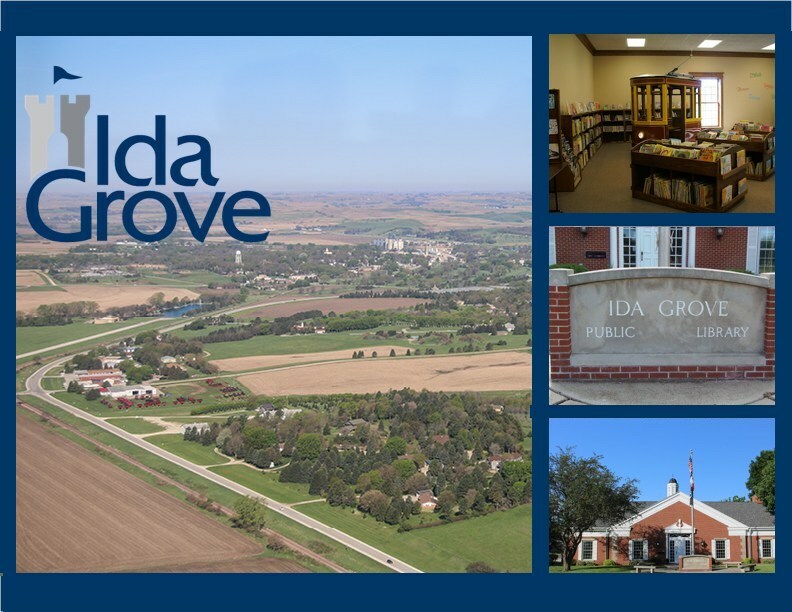 The council voted to submit the vote to the people as follows: "Shall the city of Ida Grove accept the present library as a free public library, the same to be maintained by the said city as provided in sections 727 & 732 of the 1913 supplement to the Code of Iowa?" In 1922 circulation was free to the public after the city voted a one and one-fourth mills tax for library support. In the Spring of 1978, the public library moved to it's present location on Second Street. July 1st, 2008 saw a groundbreaking ceremony for construction of the new addition. Just under a year later, on May 30, 2009, a Grand Opening was celebrated for our new Children's Library. The 1,800 square foot addition provides a place just for kids, including a computer area, arts and crafts area, performance stage, and a trolley. From it's beginning in 1908, the library has continued to grow and thrive in our community. In 1937 the library collection consisted of just 4,904 books. Today, the library consists of much, much more. Our collection today includes 32,388 physical and down loadable volumes for circulation, including: books, audio books, e-books, and DVD's, along with subscriptions to local and area newspapers and 33 magazines. A large genealogy collection, provided by the Ida County Genealogical Society, is available for in library use. The library also provides circulation of resource kits and baking items that compliment our current collection. The Ida Grove Library offers eight (four adult, four children's) free public access computers for patron use, along with free 'wi-fi' both inside and outside of the building, proctoring services, a public meeting room, Inter-library Loan services, copying, faxing, and printing. We are proud to provide all of our patrons and the community with more than just books.